The Presidency this morning handed over two Presidential Fleet aircraft to the Nigerian Air Force. This comes few days after two others were put up for sale on National dailies. The two Helicopters are part of the 10 aircraft in Presidential Air Fleet. They were acquired on 20 Oct 2014 and 21 May 2015 respectively. 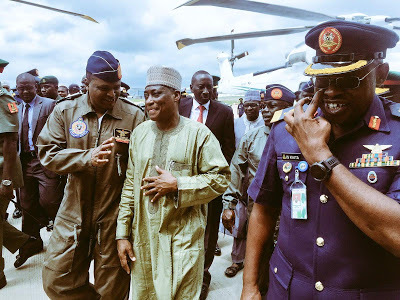 This is 2nd handover of aircraft from Presidential Air Fleet to Nigerian Air Force. 1st handover was in 2015, shortly after PMB took over. The first handover of Pres Air Fleet aircraft involved two Helicopters, handed over to Air Force in 2015 to boost operations in Northeast. The two aircraft being handed over today are AgustaWestland AW101 helicopters. They possess Ballistics defence capabilities, & are equipped against certain forms of missile attacks.